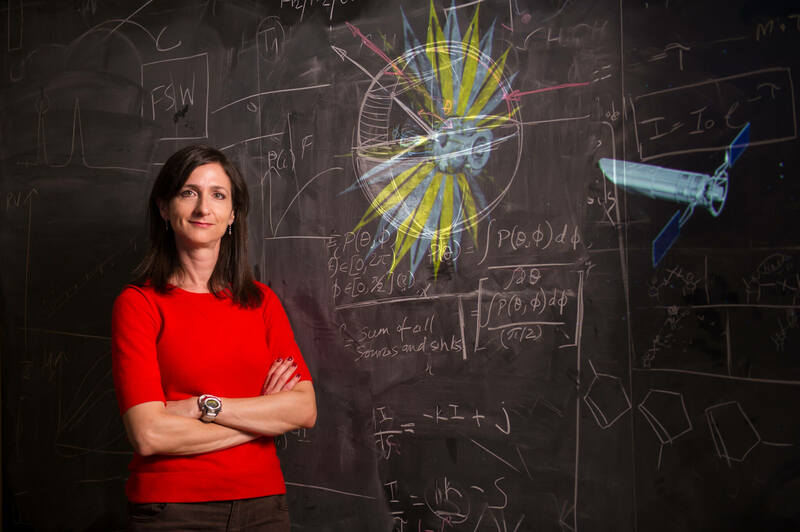 Like many astrophysicists, Sara Seager sometimes has a problem with her perception of scale. Knowing that there are hundreds of billions of galaxies, and that each might contain hundreds of billions of stars, can make the lives of astrophysicists and even those closest to them seem insignificant. Their work can also, paradoxically, bolster their sense of themselves. Believing that you alone might answer the question “Are we alone?” requires considerable ego. Astrophysicists are forever toggling between feelings of bigness and smallness, of hubris and humility, depending on whether they’re looking out or within. One perfect blue-sky Autumn day, Seager boarded a train in Concord, Massachusetts, on her way to her office at Massachusetts Institute of Technology (MIT) and realised she didn’t have her phone. She couldn’t seem to decide whether this was or wasn’t a big deal. Not having her phone would make the day tricky in some ways, because her sons, 13-year-old Max and 11-year-old Alex, had a soccer game after school, and she would need to coordinate a lift to watch them. She also wanted to be able to find and sit with her best friend, Melissa, who sometimes takes the same train to work. “She’s my best friend, but I know she has other best friends,” Seager said, wanting to make the nature of their relationship clear. She is an admirer of clarity. She also likes absolutes, wide-open spaces and time to think, but not too much time to think. She took out her laptop to see if she could email Melissa. The train’s Wi-Fi was down. She would have to occupy herself on the commute alone. Seager’s office is on the 17th floor of MIT’s Green Building, the tallest building in Cambridge, its roof dotted with meteorological and radar equipment. She is a tenured professor of physics and of planetary science, certified a “genius” by the MacArthur Foundation in 2013. Her area of expertise is the relatively new field of exoplanets: ones that orbit stars other than our sun. More particular, she wants to find an Earthlike exoplanet — a rocky planet of reasonable mass that orbits its star within a temperate “Goldilocks zone” that is not too hot or too cold, which would allow water to remain liquid — and determine that there is life on it. That is as simple as her maths gets. Her office is spare. There is a set of bookshelves — “Optics” and “Asteroids III” and “How to Build a Habitable Planet” — topped with a row of certificates and honours leaning against a chalkboard covered with equations. In addition to the MacArthur award, which doesn’t come with a certificate but with $625,000, she is proudest of her election to the US National Academy of Sciences. Although the line between lunacy and scientific fact is constantly shifting, the search for aliens still occupies the shadows of cranks, and Seager hears from them almost daily, or at least her assistant does. By the standards of her universe, Seager is famous. She is careful about the company she keeps and the words she chooses. She isn’t searching for aliens. She’s searching for exoplanets that show signs of life. She’s searching for a familiar blue dot in the sky. That means Seager, who is 45, has given herself a very difficult problem to solve, the problem that has always plagued astronomy, which, at its essence, is the study of light: Light wages war with itself. Light pollutes. Light blinds. Seager has a commanding view of downtown Boston from her office window. She can sweep her eyes, hazel and intense, all the way from the gold Capitol dome to Fenway Park. When Seager works at night and the Red Sox are in town, she sometimes has to close her curtains, because the ballpark’s white lights are so glaring. And on this morning, after the sun completed its rise, her enviable vista became unbearable. It was searing, and she had to draw her curtains. That’s how light can be the object of her passion and also her enemy. Little lights — exoplanets — are washed out by bigger lights — their stars — the way stars are washed out by our biggest light, the sun. Seager’s challenge is that she has dedicated her life to the search for the smallest lights. The vastness of space almost defies conventional measures of distance. Driving the speed limit to Alpha Centauri, the nearest star grouping to the sun, would take 50 million years or so; our fastest current spacecraft would make the trip in a relatively brisk 73,000 years. The next-nearest star is six light-years away. To rocket across our galaxy would take about 23,000 times as long as a trip to Alpha Centauri, or 1.7 billion years, and the Milky Way is just one of hundreds of billions of galaxies. The Hubble Space Telescope once searched a tiny fragment of the night sky, the size of a penny held at arm’s length, that was long thought by astronomers to be dark. It contained 3,000 previously unseen points of light. Not 3,000 new stars — 3,000 new galaxies. And in all those galaxies, orbiting around some large percentage of each of their virtually countless stars: planets. Planets like Neptune, planets like Mercury, planets like Earth. As late as the 1990s, exoplanets remained a largely theoretical construct. Logic dictated that they must be out there, but proof of their existence remained as out of reach as they were. It wasn’t until 1995 that the colossal 51 Pegasi b, the first widely recognised exoplanet orbiting a sunlike star, was found by a pair of Swiss astronomers using a light-analysing spectrograph. The Swiss didn’t see 51 Pegasi b; no one has. By using a complex mathematical method called radial velocity, they witnessed the planet’s gravitational effect on its star and deduced that it must be there. There has been an explosion of knowledge in the relatively short time since, in part because of Seager’s pioneering theoretical work in using light to study the composition of alien atmospheres. When starlight passes through a planet’s atmosphere, certain potentially life-betraying gases, like oxygen, will block particular wavelengths of light. It’s a way of seeing something by looking for what’s not there. Light, or its absence, is also the root of something called the transit technique, a newer, more efficient way than radial velocity of finding exoplanets by looking at their stars. It treats light almost like music, something that can be sensed more accurately than it can be seen. The Kepler space telescope, launched in 2009 and now trailing 75 million miles behind Earth, detects exoplanets when they orbit between their stars and the telescope’s mirrors, making tiny but measurable partial eclipses. A planet the size of Jupiter passing in front of its sun might result in a 1% dip in the amount of starlight Kepler receives, a drop that, in time, reveals itself to be as regular as rhythm, as an orbit. The transit technique has led to a bonanza of finds. In May, NASA announced the validation of 1,284 exoplanets, by far the largest single collection of new worlds yet. There are now 3,414 confirmed exoplanets and an additional 4,696 suspected ones, the count forever increasing. Before Kepler, the nature of the transit technique meant that most of those exoplanets were “Hot Jupiters,” giant balls of hydrogen and helium with short orbits, making them scalding, lifeless behemoths. But in April 2014, Kepler found its first Earth-size exoplanet in its star’s habitable zone: Kepler-186f. It’s about 10% larger than Earth and orbits on the outer reaches of where the temperature could allow life. No one knows the mass, composition or density of Kepler-186f, but its discovery remains a revelation. Kepler was searching, somewhat blindly, an impossibly small sliver of space, and it found a potentially hab itable world more quickly than anyone might have guessed. In August, astronomers at the European Southern Observatory announced that they had detected a somewhat similar planet orbiting Proxima Centauri, the single star closest to us after the sun. They named it Proxima Centauri b. Studying the data, Seager supported the discovery and agreed that it might boast a life-sustaining — or at least non-life-threatening — surface temperature. There are now nearly 300 confirmed exoplanets or candidates orbiting within the habitable zones of their stars. Extrapolating the maths, NASA scientists now believe that there are tens of billions of potentially life-sustaining planets in the Milky Way alone. The odds practically guarantee that a habitable planet is somewhere out there and that someone or something else is, too. In some ways, the search for life is now where the search for exoplanets was 20 years ago: Common sense suggests a presence that we can’t confirm. Seager understands that we won’t know they’re out there until we more truly lay eyes on their home and see something that reminds us of ours. Maybe it’s the colour blue; maybe it’s clouds; maybe, however many generations from now, it’s the orange electrical grids of alien cities, the black rectangles of their lightless Central Parks. But how could we ever begin to look that far? “Everything brave has to start somewhere,” Seager says. The beginning of her next potential breakthrough hangs on the wall opposite the window in her office. It is a two-thirds scale model of a single petal of something called the starshade. She has been a leading proponent of the starshade project, and outside her teaching, it is one of her principal professional concerns. Imagine that far-off aliens with our present technology were trying to find us. At best, they would see Jupiter. We would be lost in the sun’s glare. The same is true for our trying to see them. The starshade is a way to block the light from our theoretical twin’s sun, an idea floated in 1962 by Lyman Spitzer, who also laid the groundwork for space telescopes like Hubble. The starshade is a huge shield, about 100 feet across. For practical reasons that have to do with the bending of light, but also lend it a certain cosmic beauty, the starshade is shaped exactly like a sunflower. By Seager’s hopeful reckoning, one day the starshade will be rocketed into space and unfurled, working in tandem with a new space telescope like the Wfirst, scheduled to launch in the mid-2020s. When the telescope is aimed at a particular planetary system, lasers will help align the starshade, floating more than 18,000 miles away, between the telescope and the distant star, closing the curtains on it. With the big light extinguished, the little lights, including a potential Earthlike planet and everything it might represent, will become clear. We will see them. The trouble is that sometimes the simplest ideas are the most complicated to execute. About once a decade since Spitzer’s proposal — he could work out the maths but not the mechanics — someone else has taken up the cause, advancing the starshade slightly closer to reality before technological or political inertia set in. Three years ago, Seager joined a new, NASA-sponsored study to try to overcome the final practical hurdles; NASA then chose her from among her fellow committee members to lead the effort. After those decades of false starts, Seager and her team have already succeeded in making the starshade seem like a real possibility. NASA recognised it as a “technology project,” which is astral-bureaucracy speak for “this might actually happen.” Today the starshade is a piece of buildable, functional hardware. Seager packs that single petal into a battered black case and wheels it, along with a miniature model of the starshade, into classrooms and conferences and the halls of Congress, trying to find the momentum and hundreds of millions of dollars that allow impossible things to exist. She has her intelligence, and her credentials, and her audience. She has her focus. But maybe more than anything else, Seager understands in ways few of us do that sometimes you need darkness to see. Seager grew up in Toronto, wired in a way all her own. “Ever since I was a child, there was just something about me that wasn’t quite like the others,” she says. After her parents divorced, her father, Dr David Seager, achieved a certain fame by becoming one of the world’s leaders in hair transplants. The Seager Hair Transplant Centre still operates and bears his name a decade after his death. David Seager was besotted with his bright daughter and wanted her to become a physician. Seager did her best to fit in. Sometimes she did; mostly she didn’t. Eventually, she gave up trying. She still talks breathlessly — “without enough modulation,” she has learned by listening to other people talk. She has never had the patience to invest in something like watching TV. “Things just move too slowly,” she says. “It feels like a drag.” She sleeps a lot, but that’s just a concession to her biology; she recognises that she’s a more efficient machine when she’s rested. But if Seager’s apartness didn’t make her insecure, it also made her feel as though the expectations of others didn’t apply to her. “I loved the stars,” she says. When she was 16, she bought a telescope. Friendless for most of her childhood, Seager eventually forged her way to her own vision of the good life. She found and married a quiet man named Mike Wevrick, whom she met on a ski trip with her canoe club. She and Wevrick had Max and Alex; Seager was hired by MIT, and she and Wevrick and the boys moved into a pretty yellow Victorian house in Concord. She took the train to work. Wevrick, a freelance editor, managed just about everything that didn’t involve the search for intelligent life in the universe. Seager never shopped for groceries or cooked or got fuel for the car. All she had to do was find another Earth. Then, in the Autumn of 2009, Wevrick got a stomachache that drove him to bed. They figured it was the flu. Wevrick didn’t have the flu, but a rare cancer of the small intestine. They were told that the initial prospects were good, and he fought the cancer sufferer’s systematic fight. But while laws govern astrophysics, cancer is an anarchist. About a year after Wevrick’s diagnosis, he and Seager went cross-country skiing, and he couldn’t keep up. A few more terrible months passed, and he began writing out a methodical three-page list, practical advice for Seager after his death. It wasn’t a love letter; it was an instruction manual for life on Earth. By June 2011, he was 47 and in home hospice. Seager asked him how to get the roof rack that carried his canoes off the car. “It’s too complicated to explain,” Wevrick said. That July, he died. The first couple of months after Wevrick’s death were weird. Seager felt a surprising sense of relief from the uncertainties of sickness, a kind of liberation. She didn’t care about conventions like money, which she had never needed to manage, and she took the boys on some epic trips. There are pictures of them smiling together in the deserts of New Mexico, on mountaintops in Hawaii. Then one day, she went into Boston for a haircut and accidentally walked into a lawyer’s office next to the salon. Seager ended up talking to a woman inside. That woman was also a widow, and she told Seager that there would be a moment, as inevitable as death itself, when her feelings of release would be replaced by the more lasting aimlessness of the lost. Seager walked back outside, and just like that, the world came out from under her feet. She fell into an impossible blackness. Later that winter, she took the boys sledding at the big hill in Concord. Two other women and their children were there. Seager stared at them coldly. They were smiling and carefree with their perfect, blissful lives. Seager felt ugly and ruined next to them. Then Alex, who was six at the time, had a meltdown. He sprawled himself across the hill so that the other children couldn’t go down it. The two other mothers tried to get him to move. “He has a problem,” Seager told them. They continued to try to shift him. “HE HAS A PROBLEM,” Seager said. “MY HUSBAND DIED.” “Mine, too,” one of the other women said. That was Melissa. A few weeks later, on Valentine’s Day, Seager was invited to her first gathering of the widows. Today, Melissa says she could detect the telltale “flintiness” of the recently bereaved the moment she saw Seager on the hill. Now there were six widows united in Concord, each middle-aged, each in a different stage of grief, drawn together by the peculiar pull of the unlucky. Three had been widowed by cancer, two by accidents — bicycling and hiking — and one by suicide. Melissa’s husband was four years gone, Seager’s seven months. Widowhood was like a new universe for Seager to explore. She had never understood many social norms. The celebration of birthdays, for instance. “I just don’t see the point,” she says. She had also drawn a hard line against Christmas and its myths. “I never wanted my kids to believe in Santa.” After Wevrick’s death, she became even more of a satellite, developing a deeper intolerance for life’s ordinary concerns. Making dinner seemed an insurmountable chore, the routine of school lunches a form of torture. The roof needed to be replaced, and she didn’t have the faintest idea how to get it fixed. She wasn’t sure how to swipe credit cards. If the answers to her questions weren’t somewhere on Wevrick’s three wrinkled sheets of paper, it could feel as though they were locked in a safe. There was a pendant light in her front hall, where the boys would fight with their toy lightsabers, and sometimes they would hit the light with their wild swings. Seager decided that either the light or one of the boys was going to end up damaged. She asked the widows how to do electrical work — “I have to parcel out things with logic and evidence,” she says — got out the ladder and took down the light, carefully wrapping black tape around the ends of the bare wires that now poked through the hole in the ceiling. She remembers thinking that her removing that light, all by herself, represented the height of her new accomplishment. She felt so reduced. She felt so gigantic. For all of her real and perceived strangeness, the most unusual thing about Seager is her blindness to her greatest gift. She is more than aware of her preternatural mathematical abilities, her possession of a rare mind that can see numbers and their functions as clearly as the rest of us see colours and shapes. “I’m good at that stuff,” she says with her brand of factual certainty that is sometimes confused with arrogance. She knows she is unusually capable of turning abstract concepts into things that can be packed into a case. What she doesn’t always see is her knack for connection between places if not always people, the unconventional grace she possesses when it comes to closing unfathomable distances. Sara Seager speaks at a press conference in 2014 discussing ‘the scientific and technological roadmap that will lead to the discovery of potentially habitable worlds among the stars’. Seager has lined the hallway outside her office with a series of magical travel posters put out by the Jet Propulsion Laboratory. Each gives a glimpse of the alien worlds that, in part because of her, we now know exist. There’s a poster for Kepler-16b, an exoplanet that orbits a pair of stars, like Luke Skywalker’s home planet of Tatooine. Kepler-186f is depicted with red grass and red leaves on its trees, because its star is cooler and redder than the sun, which might influence photosynthesis in foliage-altering ways. There’s even one for PSO J318.5-22, a rogue planet that doesn’t orbit a star but instead wanders across the galaxy, cast in perpetual darkness, swept by rain of molten iron. After the discovery of Proxima Centauri b, Seager wrote a galactic postcard from it for the website Quartz. She closed her eyes and imagined a world 25 trillion miles away. “For the average earthling,” she wrote, “visiting this planet might not be much fun.” She saw a planet perhaps a third larger than Earth, with an orbit of only 11 days. Like the moon’s relationship to Earth, one side of the planet always faces its star, which is always in the same place in its sky. Parts of Proxima Centauri b are cast in perpetual sunrise or sunset. One side is always in darkness. At first, after Wevrick’s death, Seager thought about abandoning her work, because she was having such a hard time with her responsibilities at home. Her dean talked her out of quitting, giving her financial support to hire caregivers for the boys and urging her to redouble her efforts. Seager has always found comfort and perhaps even solace in her work, in her search for another and maybe better version of our world. In her mourning, each discovery represented one more avenue of escape. In the spring of 2013, she was given responsibility for the starshade. That July, she met a tall, fast-walking man named Charles Darrow. Darrow, who is now 53, was an amateur astronomer and the president of the Toronto branch of the Royal Astronomical Society of Canada, and at the last minute he decided to go to the society’s annual meeting in Thunder Bay, Ontario. Darrow was on his way out of a profoundly unhappy marriage; he worked for his family business, an engine-parts wholesaler. He needed a break, and he pointed his car north. “I wanted to be alone,” he says. At a reception on the Friday evening, Darrow noticed a hazel-eyed woman staring at him from across the room. “I thought she was looking at someone behind me,” he says. Then he went into the lecture hall, and the same woman was that night’s keynote speaker. She talked about exoplanets. The next day, lunch was in a university cafeteria. The woman was in the salad line ahead of him, and she turned around. Darrow mustered up his courage and invited Sara Seager to join him. “I knew about five minutes into the conversation that my life was going to change,” he says. Seager was taken with Darrow the night she saw him in Thunder Bay. She had been struck by the contrast between the whiteness of his shirt and his tanned summer skin. But she didn’t have the same certainty that possessed him at their lunch the next day. She wasn’t sure how to develop a relationship across the 549 miles between her home in Concord and his home outside Toronto. She thought they might never cross paths again. They might not have, except Darrow resolved during his drive back home that he had to call her. He picked up the phone five times but always hung up before she answered. On the sixth, he spoke to her, beginning a long correspondence, emails and conversations over Skype. Darrow and Seager talked every way but face to face. They fell in love remotely. Melissa, meanwhile, told Seager that if she could close the gap between here and a planet like Kepler-186f — a journey that would take us 500 light-years to complete — then the 549 miles between Concord and Toronto shouldn’t seem like such an insurmountable gulf. By her usual measures, he was right next door. Seager and Darrow married in April 2015. In different ways, each had rescued the other. Seager was the cataclysm that allowed Darrow to make every correction. He divorced, left his family business and moved into a pretty yellow Victorian house in Concord. The two boys started calling him dad. For Seager, Darrow was a second chance to know love, even deeper than the one she had known, because it seemed so improbable in her sadness. He cooks dinner; he helps take care of the boys; he maintains the house; he walks with Seager to the train station every morning, and he picks her up every night. He has chosen to take care of the mundane so that she can devote herself to the extraordinary. But he banged his head more than once on Wevrick’s canoe, which still hung from the back of the garage. Not long ago, Darrow was looking for the right ways to assert his presence, to make a claim to a house that didn’t always feel like his. The wires dangling from the front hall ceiling bothered him. They looked bad and seemed dangerous. A few months after his arrival in Concord, he took his opening. He carved out some of the plaster, installed a plastic box, ran the wires through it and hooked up a new fixture, flush mounted, so that the boys wouldn’t hit it during their duels. Darrow climbed down from the ladder and flicked the switch. The morning after she forgot her phone, Seager woke up and decided, just like that, to skip the commute. With the house to herself, she tried to make coffee. She left out part of the machine, and after some terrible noises, the pot was bone dry. She sat down at her kitchen table with her empty mug and began talking about hundreds of billions of galaxies and their hundreds of billions of stars. Tens of billions of habitable planets, far more of them than there are people on Earth. There has to be other life somewhere out there. We can’t be that special. “It would be arrogant to think so,” Seager said. But in her lifetime, after the Wfirst telescope rockets into orbit, and maybe her starshade follows it — she puts the chances of success at 85% — she will have time to explore only the nearest hundred stars or so. A hundred stars out of all those lights in the sky, a fraction of a fraction of a fraction. Will one of them have a small, rocky planet like Earth? Probably. Will one of those small, rocky planets have liquid water on it? Possibly. Will the planet sustain life? Now the odds tilt. Now they are working against her, and she knows it. Now they’re maybe one in a million that she’ll find what she’s looking for. She did some private maths. “I believe,” she said. Seager’s discovery will be fate-altering if it comes, but it will also be quiet, a few pixels on a screen. It will obey the laws of physics. It will be a probability equation: What are the chances? We won’t discover that there is life on other planets the way we’ve been taught that we’ll learn. There won’t be some great mother ship descending from the sky over Johannesburg or a bizarre lightning storm that monsters will ride to New Jersey. What Seager will have is a photograph from a space telescope of a distant solar system, with its star eclipsed by her starshade, and with a familiar blue dot some safe and survivable distance away from it. That’s all the evidence she will have that we’re not alone, and that will be all the evidence she will need. Her proof of life will be a small light where there wasn’t one before.